Brightness – What is a NIT? A NIT is a measurement of light in candelas per meter square (Cd/m2). In basic terms, it is a measurement of the amount of light (brightness) emitting from the display. A NIT is a good basic reference when comparing brightness from panel to panel. Most desktop monitors or laptops use LCD displays with brightness levels of 200 to 400 Nits. These standard LCD’s are not readable in direct or even indirect sunlight because they appear washed out. As a rule, experts consider an LCD panel to be “sunlight readable” if it has a brightness rating of at least 1,000 NITS. To achieve this brightness, we replace the panel manufactures standard LED light rails with custom light rails that produce a much higher volume of light. Additionally, we replace the LED driver which powers the LED backlights. To evenly distribute the light across the panel surface, we replace pieces of film (sheets of plastic) that utilize special prisms. Yet, simply pushing more light through the front of the panel does not make it sunlight viewable without addressing the next factor we mentioned above, contrast. Contrast – What Does Your Eye See? 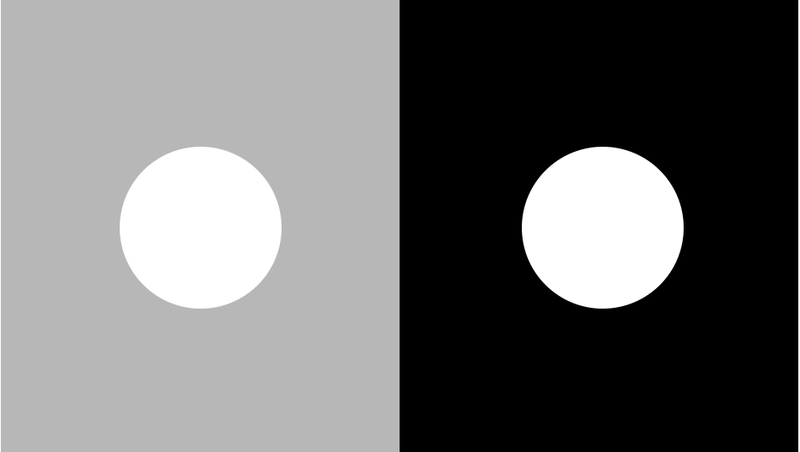 In simplified terms, contrast is the difference between the brightest “white” and the darkest “black” produced on a display and appears as a ratio. For sunlight viewable displays, a contrast ratio of 5 to 1 or 5:1 is the minimum. So, from a user’s perspective, if an LCD panel has a higher contrast ratio, the displayed picture appears sharper and of higher quality than a picture on an LCD panel with a lower contrast ratio. Example: In Fig. 1, both circles are the same color but the one on the right seems brighter because it sits on the darker background. Brightening a display increases the values of the lights and darks simultaneously, which does not improve contrast or readability. Hence, we apply additional technologies to the LCD panel to increase the contrast in concert with increasing the brightness. However, these technologies are tightly held trade secrets of each individual manufacturer, so we cannot discuss them here in detail. A very bright LCD panel with a high contrast ratio can still suffer from poor picture quality if our third factor is not addressed. Reflections – What is Glare? There are two types of reflections as it relates to sunlight readable displays, external and internal. External reflections are easier to explain as we are all familiar with how a mirror works. Like a mirror, if the front surface of a display has a glossy finish it will reflect bright light sources (like the sun) and light colored objects. We often refer to these types of reflections as glare. We have minimized external reflections by using top surface treatments such as matte finish polarizers or anti-reflective or anti-glare glass. To perform well, both treatments need to remain clean since dirt or oils (from finger touches) are reflective and will degrade their performance. Combating internal reflections is a much more challenging. To understand how internal reflections are created, we need to delve a bit into the properties of light (which gets a bit complicated). When light travels through transparent materials with different refraction properties such as glass, plastic, or air, the light bends. Science refers to this bend as the index of refraction, “a measure of the extent a substance slows down light waves passing through it” (The American Heritage® Science Dictionary). Viewers perceive these internal bends or refractions of light as glare. All surfaces, internal and external, that have an index refraction mismatch (they slow light at different degrees) will generate reflections accumulatively. Thus, the more surfaces, like adding a touch screen to the display, the more refractions resulting in a higher level of glare. The Fig. 2 illustration demonstrates the cumulative effect of reflections on an LCD display with a touch screen installed. 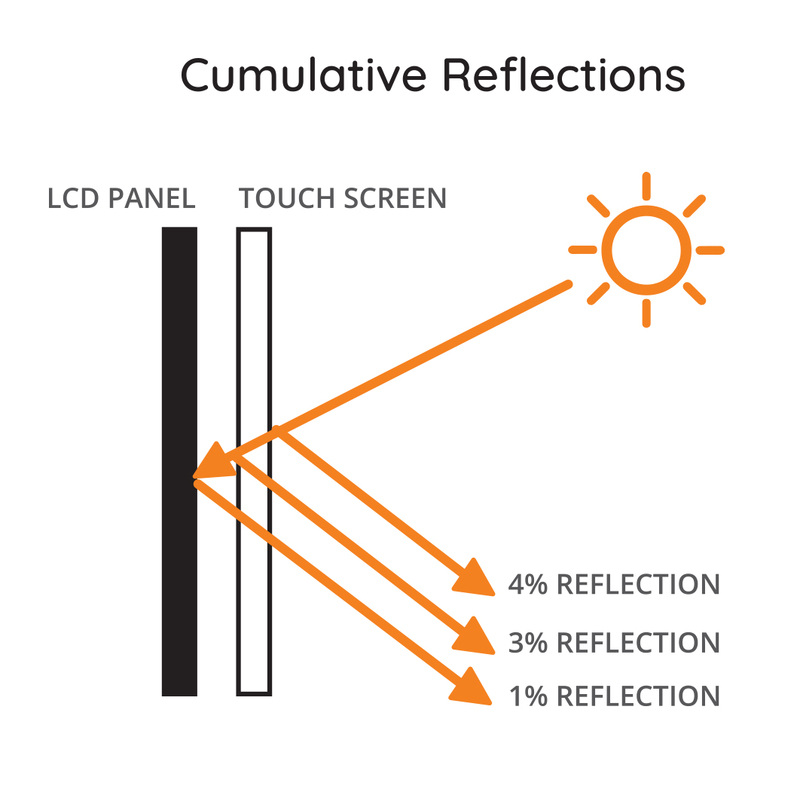 The front and backside surfaces of the touch screen and the front surface of the LCD panel all have different light refraction properties resulting in a total 8% reflections. Even a display generating 1,000 nits of brightness would have difficulty overpowering 8 percent reflections. In recent years, experts have perfected the technology called optical bonding to overcome internal reflections.